Plenty has already been written on the anticipations of outside (read: Russian) interference in the 2018 Swedish parliamentary election. There were no major disturbances, which in my opinion was not a surprise. However, a few fake documents that I recently discovered shed interesting light on a perhaps botched campaign to smear the Swedish election process, a campaign which involved the implication of the Sweden Democrats in a Russian intelligence operation. It remains unclear who was behind this disinformation campaign, although a few markers point to a Russian-sponsored actor. Interestingly, a secondary wider goal with the campaign seems to have been the smearing of Ukraine and NATO. On 20 August 2018, two fake documents appeared on the Swedish website Pressbladet, a website where anyone can register to publish and which in the past has been used for the distribution of Russian disinformation. The first document is a fake letter from US Secretary of State Mike Pompeo to his Polish colleague Jacek Czaputowicz. The letter explains that the US has learned about the deep ties between the Sweden Democrats and Russian security services. The goal of Russia, Pompeo alleges, is to control the Sweden Democrats in order to further its interests in Sweden and the EU. This document was also posted on a few other, English language, websites, here and here. The second document is a fake letter from Marine Le Pen, the President of Rassemblement National (formerly Front National) to Jimmie Åkesson, the leader of the Sweden Democrats. In this letter, Le Pen promises to provide 127 election observers and organisational support for the Sweden Democrats in the Swedish election. On the surface of it, it looks like the creators of these fake documents attempted to spin the issue of Russian election interference in various Western countries, using the Sweden Democrats as a useful tool. It should be noted, however, that there is no evidence that the leadership of the Sweden Democrats favours any unique political ties to the Kremlin, although a few party members in the past have expressed an understanding of or sympathy towards Vladimir Putin (although they were, however, usually reprimanded for this). The story also has a broader international dimension. On the forum StudentRoom also a third fake document has appeared, a letter purportedly written by Ukraine’s Prime Minister Volodymyr Groysman to his Minister of Information Policy Yuriy Stets. In this letter, Groysman reveals a far reaching Ukrainian conspiracy to meddle with the Swedish elections in order to advance the agenda of the Social Democrats and the Green Party, and to damage the Sweden Democrats. Interestingly, this post attracted a few comments from readers who apparently think the documents may be authentic. What does the reference to StratCom here mean? Well, the article links to a fake pornographic Twitter account Axel Solberg, who on the website Medium posted a hacked letter from StratCom alleging Russian cyber attacks against the Social Democrats. 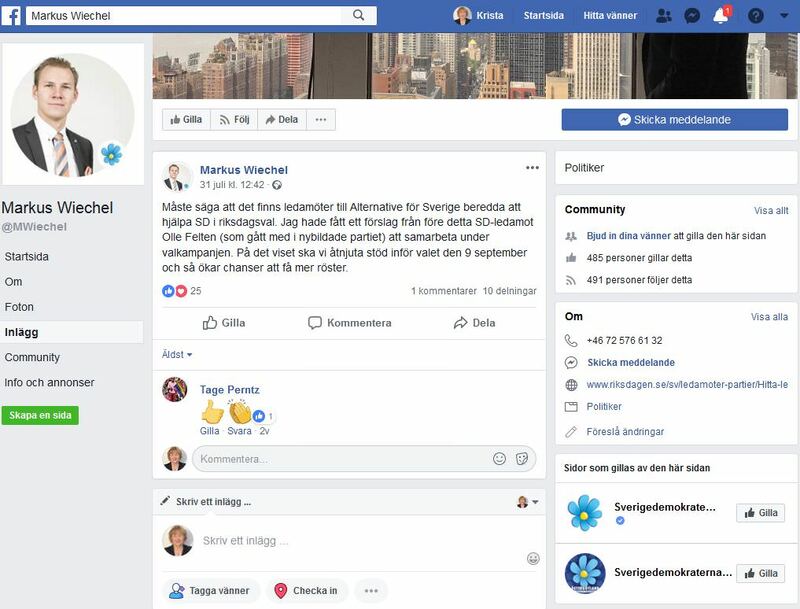 The same article also provides several links to Swedish web forums, where various rumours about the election were spread, including one Facebook post by the Sweden Democrat Markus Wiechel which I have not been able to verify but which strikes me as peculiar (anyone who can give me information on this part is welcome to send me an e-mail). In conclusion, what are we dealing with here? In the past, it is known that Russian-sponsored actors (troll factories, intelligence services) have disseminated fake documents and letters in order to further various agendas. In the cases discssued above, no strong linkages to Russia exist (like for example Russian media outlets citing them), although a few markers do point in that direction. First, the style, language, and tone of the fake documents all resemble established Russian fakes. Second, the mode of dissemination of the fake documents and various stories that go along with them. Third, the different conspiracies that all add up to a smear of Western states, Ukraine and NATO, three favourite targets of Russia historically and today. It will be interesting to see if these documents will reappear somewhere else in the future, and what we can learn more then. Update: Swedish daily newspaper Dagens Nyheter wrote an article based on my post above.